Write: Before we begin. How would YOU define healthy? What do YOU think is a healthy diet? Create a menu for today breakfast, lunch, dinner and snacks that would fit into your definition of healthy. Write: wow. There is a HUGE variety of thought on what is the BEST diet to being healthy. There are 3 common themes that they can all agree on. Write them down! Remember: Real Foods Rots. Processed foods...do not. 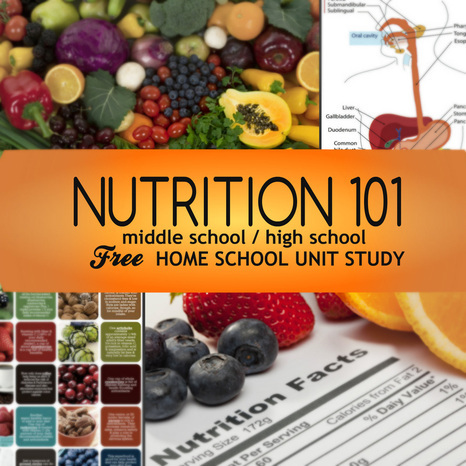 Nutrition is an ideal homeschooling unit study. This six to nine week study was designed for the 10 – 14 year olds in our family. It would be ideal for your homeschool co-op. We start by learning basic biology / anatomy the digestive system. Then we explore WHAT we put in our bodies and how it effects our health. The kids will then explore farming and the movement towards local foods. Enjoy this multimedia hands on unit study. Here is my assignment and grade sheet for my high school student based on this six unit study PART 1. Where we get our food? These are the extra interactive resources.